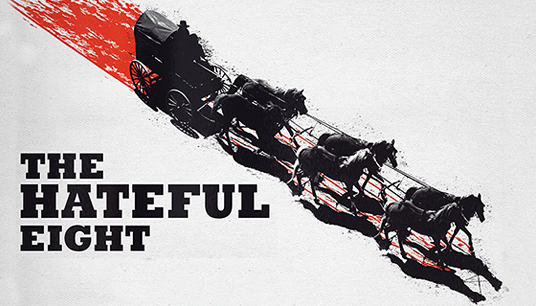 We finally have a good long trailer for Quentin Tarantino’s new film ‘The Hateful Eight‘, and boy does it look amazing. Then again, what Tarantino film isn’t amazing? I hope Tarantino never stops making films. Official Synopsis: In THE HATEFUL EIGHT, set six or eight or twelve years after the Civil War, a stagecoach hurtles through the wintry Wyoming landscape. The passengers, bounty hunter John Ruth (Russell) and his fugitive Daisy Domergue (Leigh), race towards the town of Red Rock where Ruth, known in these parts as “The Hangman,” will bring Domergue to justice. Along the road, they encounter two strangers: Major Marquis Warren (Jackson), a black former union soldier turned infamous bounty hunter, and Chris Mannix (Goggins), a southern renegade who claims to be the town’s new Sheriff. Losing their lead on the blizzard, Ruth, Domergue, Warren and Mannix seek refuge at Minnie’s Haberdashery, a stagecoach stopover on a mountain pass. When they arrive at Minnie’s, they are greeted not by the proprietor but by four unfamiliar faces. Bob (Bichir), who’s taking care of Minnie’s while she’s visiting her mother, is holed up with Oswaldo Mobray (Roth), the hangman of Red Rock, cow-puncher Joe Gage (Madsen), and Confederate General Sanford Smithers (Dern). As the storm overtakes the mountainside stopover, our eight travelers come to learn they may not make it to Red Rock after all. This entry was posted on Wednesday, August 12th, 2015 at 11:33 am	and is filed under Film, News. You can follow any responses to this entry through the RSS 2.0 feed. You can skip to the end and leave a response. Pinging is currently not allowed. It can definitely take my money. Hi Bryan! Jessica’s mom here! Can’t wait to meet you and DANCE! Doesn’t seem particularly enticing to me. In fact, it seems like the same old thing we’ve seen time and time again in every single other Tarantino film. Seriously, he basically tells the same story with the same characters, just in different settings. Who taught you how to write? This is terrible. If you are going to use parenthetical surnames, you could at least add a list with the actors full name at the beginning of the article. « Christopher Guest Brings ‘Mascots’ To Netflix in 2016!! !